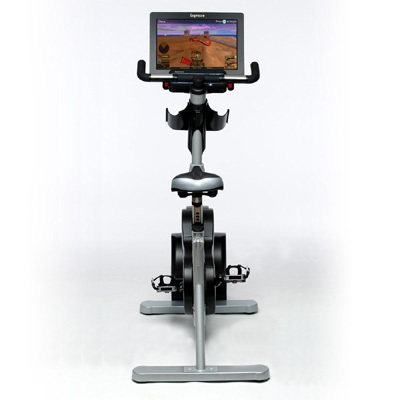 The Expresso Interactive Upright Exercise Bike is the most realistic riding experience available on the market. This upright home exercise bike has a dual-belt resistance system that provides a smooth and quiet cycling motion. It is also fully adjustable to accommodate just about any cyclist. 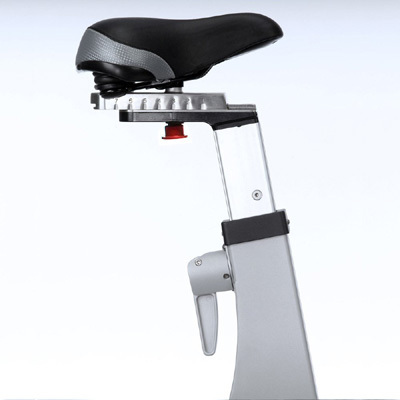 The Expresso Interactive Upright Stationary Exercise Bike also allows you to monitor your heart rate through grip sensors or with the chest strap that is included with the bike. But the thing that makes this bike feel so realistic is its interactive virtual reality programs. This bike has a large 19” visual display that puts you right into the action. You can steer your bike through 30 pre-programmed tours and chases and change gears as you race against other cyclists or even against yourself as a ghost rider. These programs are arranged over four different levels of difficulty and your workout data can be monitored so that you can track your performance over time. Click here to see the price of the Expresso Interactive Upright Exercise Bike on Amazon. Advanced drive train uses a dual-belt resistance system that provides fluid motion, quiet operation and supports up to 700 Watts or riding power. Heart rate sensors conveniently located on the grips. It is also has polar-compatible heart rate sensors if you choose to use a chest strap. Steering and shifting controls for 30 gears conveniently located on handlebars. The controls engage the upper body creating a realistic riding experience. Low-profile, adjustable seat post supports a wide range of rider heights with vertical adjustment and fore/aft adjustments. Ergonomic seat and back rest designed for comfort to accommodate a wide range of rider types. Upright seats are available in a variety of sizes. Multi-purpose pedal design accommodates standard footwear as well as SPD-compatible shoes. Dual water bottle holder to keep you hydrated while exercising. Accommodates rider heights from 4’10” to 6’4”. 19” wide screen, high-contrast LCD protected by rugged splash guards. User Console with numeric keypad, in game controls and multimedia controls. Input power, TV and internet (wired only) connections, a main power on/off switch and a reset button are located on the bike control panel. Over 30 Tours and Chases on 4 levels of difficulty. Heads up display with real time fitness data. Tour, Chase, TV and Manual modes. Tour and Chase are virtual reality modes. The rider can steer through the selected course and the resistance will vary with the terrain of their route. TV and Manual modes feature fixed resistance and do not require steering. Riders can adjust their resistance in all modes by adjusting their gear from 1-30. In addition to the On-Bike features, network connected bikes allow riders to ride real-time against others on their local network. Shipping costs will vary for the Expresso Interactive Upright Exercise Bike – S3U depending on where you purchase from and what type of delivery you prefer. However, some retailers, such as Amazon.com, will provide free shipping. Assembly of the Expresso Interactive Upright Exercise Bike only has three screws and goes very quickly provided you have a partner to help hold the pieces in place. After assembly you also need to connect the bike to your router and configure the console, which will take a lot more time than the assembly. There are step by step instructions for all of this, including a final systems check. If you can get everything to go smoothly, you should be able to complete it in about an hour, give or take 15 minutes. 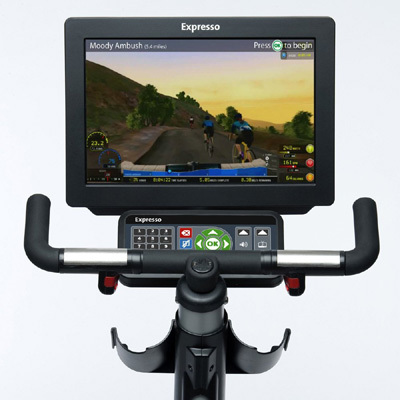 The Expresso interactive Upright Exercise Bike has one of the best computer consoles that we’ve seen on any piece of exercise equipment. It is basically a virtual reality for cycling. The bike provides 30 different cycling tours and chases across four different difficulty levels. While you’re cycling you can change gears and actually steer the cycling just as you would on the road. Connecting to the network also allows you to compete against other cyclists on the network. After you have completed a tour, the next time a ghost rider will allow you to compete against your best time on that tour. There is also data monitoring and tracking available so that you can see your improvement through time. There isn’t much else you would need in an exercise computer. The Expresso Interactive Upright Exercise Bike has all of the components and features to create a realistic cycling experience. First, it lets just about anyone get into a comfortable riding position with the not only height adjustments, but also fore/aft adjustments in the seat. These adjustments will accommodate anyone from 4’10” to 6’4”. It also provides dual sided pedals, so that if you choose, you can use SPD shoes. Finally, the interactive, virtual reality system puts you on the road, cycling and competing with other cyclists. You can get lost in the experience and forget that you’re on an exercise machine. The one thing to mention with the Expresso Interactive Upright Exercise Bike is the price and warranty. That said, when you make the investment to purchase this bike, there’s no doubt that you’re getting a quality bike that provides a realistic cycling experience. At just under $5,000, the Expresso Interactive Upright Exercise Bike is a heft investment. The one thing that concerns us with this bike is that this bike isn’t backed by a very good warranty. At this price, a little more reassurance would go a long way. That being said, this is definitely a well built, quality bike and it has excellent components and features that provide probably the most realistic cycling experience available.